We’d love your help. Let us know what’s wrong with this preview of Something Down There by Nancy Widrew. To ask other readers questions about Something Down There, please sign up. What nutbag would think finding people living in a cave way down under is a good thing? Well, Jeremy…IT’S NOT A GOOD THING! Now, Karen and Jeremy are stuck underground with some weird people for their honeymoon. And if SHE thinks things can’t get any worse, think again. They are prisoners of the underground people. Eerie, frightening, tragic, so sad, yet hopeful. The world building and character development are right on target for a horror novel. There is a sense of impending doom hanging over their heads. I do wonder how this will end . Horrorlicious. I voluntarily reviewed a free copy of Something Down There by Nancy Widrew. A wonderfully horrifying debut! Karen and Jeremy, newlyweds, find themselves in the middle of an underground cult, and their future together is suddenly thrown into question! This terrifying story takes readers down a very dark path, and into the midst of a grotesque cult. What a ride! I loved this, and can't wait to read more by Nancy Widrew! There was supposed to be four of them, but when one couple cancels, Jeremy and his wife, Karen, go spelunking anyway. They decide to go to any easier cave so there is less risk of injury. Then, Jeremy doesn’t show up for work. There’s no evidence they ever returned home. Months go by, and they’re assumed dead. I’m not crazy about confined spaces so I don’t get the desire to crawl into caves. The thought of tons of earth above me makes me shiver. And having a wacky cult kidnap me, dragging me deep There was supposed to be four of them, but when one couple cancels, Jeremy and his wife, Karen, go spelunking anyway. They decide to go to any easier cave so there is less risk of injury. Then, Jeremy doesn’t show up for work. There’s no evidence they ever returned home. Months go by, and they’re assumed dead. I’m not crazy about confined spaces so I don’t get the desire to crawl into caves. The thought of tons of earth above me makes me shiver. And having a wacky cult kidnap me, dragging me deep into the cave system, is the stuff of nightmares. This thriller wasn’t packed with action. It was subtle, just like the cult was with luring the happy couple into their trap. The tribe thought cutting themselves off from humanity was a good thing. But they couldn’t hide from it. It came with them. The jealousy, insecurity, anger. All of it followed them down the hole. And the bad times grew for Kate and Jeremy as time blurred their past lives and they started to succumb to life in the cave. It was almost like brain washing. Sooner or later they would give in and accept their fate. The author did this part really well. It felt so real as both of them caught themselves falling for the fantasy, shook it off, and fell for it again. It was becoming easier for them to forget their past than to hope for escape. Somewhere Down There reads at a steady pace. It’s a solid psychological thriller that grows on you, keeping you eager to find out who would survive and how it would end. 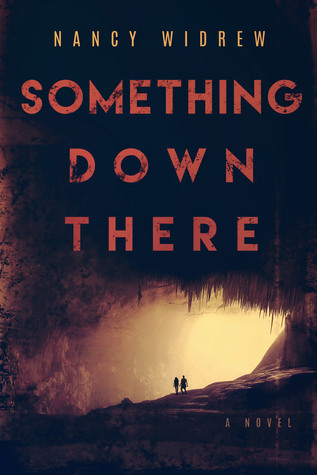 Something Down There by Nancy Widrew is an imaginative fantasy novel of a world that exists very near our everyday real world. Rather than exploring outer space or an alternative universe, the setting in this novel is a cave. Karen and Jeremy are amateur spelunkers, Jeremy a much more enthusiastic one than Karen. For Karen to reluctantly follow Jeremy into Dinky Cave, Jeremy had to promise total dedication of the next few weekends to Karen’s whims. As the two progressed ever downward in the cave Something Down There by Nancy Widrew is an imaginative fantasy novel of a world that exists very near our everyday real world. Rather than exploring outer space or an alternative universe, the setting in this novel is a cave. Karen and Jeremy are amateur spelunkers, Jeremy a much more enthusiastic one than Karen. For Karen to reluctantly follow Jeremy into Dinky Cave, Jeremy had to promise total dedication of the next few weekends to Karen’s whims. As the two progressed ever downward in the cave, they met Sara and George, a couple ascending the cave’s slopes as they prepared to go home. The couple mentioned that if Karen and Jeremy were to follow the tunnel a bit further, they would discover a waterfall. Jeremy agreed. When the two arrived at the waterfall, they were met by Rahm and Rachel. They promised to give Jeremy and Karen a brief tour of nearby cave attractions. The world of Jeremy and Karen was about to be turned literally upside down. Just as with the Hotel California, “you can enter anytime but you can never leave,” Jeremy and Karen had entered an underground world populated by seven adults and two children that were very different from the world on the surface. The core underground population could not survive inside the civilization that existed on the surface. Each of the characters had a fatal flaw that doomed development of a normal life. Rahm, the leader along with wife Rachel had identified several flawed people and invited them to a better world that existed deep inside Dinky Cave, one four levels deeper than a usual cave exploration fan would go. Rahm, Rachel, Janet, Mary, Helene, David, and Brian along with Janet’s two children, Randy and Jon, had built an almost self-sufficient society that rarely had to interact with the world above for supplies. If special supplies were needed, Rahm, as a leader, would make occasional trips to the top. There was one scarce resource that Rahm could not easily find: more group members. His idea was that the group might increase by birth. For some reason, the births either did not happen or the resultant births were not satisfactory. The only two children were boys. The group needed women who could give birth. Janet’s first son, Randy, was growing up normally. Jon, however, had a few problems. With a rat-like face and a somewhat translucent body, he was hard to look at. Either you could see through his skin to all his organs or he would appear entirely skeletal. The group needed new blood. Rahm chose Karen and Jeremy. Karen and Jeremy felt like prisoners because they were. Rahm insisted that the group consist of willing members. Once outsiders petitioned the group for acceptance, the entire core group voted on membership. Until Jeremy and Karen became members, others of the group would watch them closely. The two would have few privileges and they would be assigned daily tasks which they could not refuse to perform. No work, no food. Some of their food was from the outside world but their main diet was supplemented with fish, mushrooms and insect life found below ground. Prolonged living below ground had changed the core group lifestyle in a way difficult for Karen and Jeremy to accept. Candles provided the main source of light; a secondary source was phosphorescence from cave minerals. This was difficult for Karen and Jeremy. To navigate the dark passages, the core group developed a system of “echolocation,” a system that had to be learned. No one was going to teach Jeremy and Karen the system until they became members and could be trusted to not escape. This is a tale of the Stockholm Syndrome. In a period of prolonged activity, will the captives form a relationship with their captors? In this story we have two captives. What if one succumbs to the syndrome and the other doesn’t? This is also a story of social relationships in a closed group. What do the people do each day? How do they react with stresses and solve problems? In this group Rahm is the leader. The membership has elected him leader each year. He solves problems and assigns tasks. Not all agree with his solutions and then someone must vigorously enforce his decisions. Ask Tom, Janet’s husband. Nope, can’t do that. Tom is dead. One can’t ask Louise, Tom’s girlfriend, she is dead also. Eugene, husband to Louise, can’t speak up either (also dead). There must be order in the community; Rahm is there to provide it. This is an entertaining comfort read up to about the three-quarter point. Widrew constructs a complex alternative world while keeping it interesting by describing the physical description of the world with emotional stressors of its environment. After the three-quarter point the pace picks up and the story draws the reader even more into Jeremy and Karen’s plans for escape. The ending may surprise some, as it did me. It is not a simple or obvious conclusion and is well worth reading the novel to know. I gave this five Amazon stars because of multiple unique plot twists. My attention was drawn to the book by the author. After reading the Amazon description, I read the book for free using Kindle Unlimited. The Amazon price is USD 6.99. Spelunking in caves is scary all by itself, unless you are a daredevil or just like to be adventurous. What would ever happen if someone came up to you and told you that they live in a cave? Not just someone trying to find shelter for the night anywhere possible, but an actual village of people down below. Would you be skeptical? If you don't have a fear of claustrophobic proportions or strangers...would you follow them to find out more about this village? To some readers, this idea may be absur Spelunking in caves is scary all by itself, unless you are a daredevil or just like to be adventurous. What would ever happen if someone came up to you and told you that they live in a cave? Not just someone trying to find shelter for the night anywhere possible, but an actual village of people down below. Would you be skeptical? If you don't have a fear of claustrophobic proportions or strangers...would you follow them to find out more about this village? To some readers, this idea may be absurd! For other readers, this scenario drives their curiosity and fear of the unknown which makes quite an interesting concept. Widrew has a suspenseful adventure and one heck of an underground thriller that will keep you on the edge of your seat. Jeremy and Karen have a date set to go spelunking in a more experienced level cave with two other couples. After one couple gets sick, they call to cancel and then the other one does the same shortly after...more out of nerves then sickness. Jeremy is still determined to make a cave outing, but against Karen's fears, she agrees to go to a beginner's level cave without a third partner...a complete disregard of the rules outlined among the safety code of cave exploration. After they get there, they are relieved to find another car, meaning that another couple is down there somewhere and they are not alone. Jeremy and Karen start heading down and meet the couple, but as it turns out they are on their way out. That is when they meet Abraham, a man that sneaks up on them and tells them about the village below the first level of the cave. Karen, again has her fears and suspicion, but Jeremy is all for a story...being a reporter for a small newspaper in Baltimore. She agrees to go down just to see and then come back up after he gets everything for his story. But, Abraham has a different perspective of his new guests...the newest members of his village perhaps. In an attempt to further the survival of his people (his sick people), he has a secret agenda to keep them down there for good. What can Jeremy and Karen do to escape? With no one knowing where they are...except for the couple who they briefly met on their way out of the cave, it is a lost cause? Will they die down there or worse, become like the people who have lost their eyesight, become infertile, and have to succumb to permanent darkness. Widrew has a superb story-line and exceptional character development. All of her characters have such depth that will intrigue the reader and allow them to feel emotions like sympathy, hope, and determination. The pace is absolutely terrific; it is fast-paced with a thrilling aspect. Widrew banks on the common fears that originally comes to people who explore caves, so her explanations and convictions within the story are very original and creative. There are little to no errors in the context, which make it that much more enjoyable for the reader. If you are a reader of suspense, psychological thrillers and adventure, you may want to pick this one up. A copy of this book was provided to Turning Another Page by Book Unleashed, but this in no way affects our honest opinion of the book or the review that has been written. We provide a five-star rating for Something Down There by Nancy Widrew. I was very interested in the premise of this book; the idea had me hooked. I enjoy stories based around cults, and the idea of members of a cult moving into a cave to completely isolate themselves from the outside world seemed like an idea that would hold a lot of tension and potential. The story is a solid attempt by a first-time novelist. Would I read it a second time? Probably not, but I was entertained the first time around and other readers probably would be too. The basic plot is this: Kare I was very interested in the premise of this book; the idea had me hooked. I enjoy stories based around cults, and the idea of members of a cult moving into a cave to completely isolate themselves from the outside world seemed like an idea that would hold a lot of tension and potential. The story is a solid attempt by a first-time novelist. Would I read it a second time? Probably not, but I was entertained the first time around and other readers probably would be too. The basic plot is this: Karen and Jeremy go spelunking, are abducted by the leader of an underground cult, and are forced to assimilate. The tension comes from the couple's desire to reach the outside world again, the failed attempts of a friend to find them, and infidelity on both Karen's and Jeremy's part. The strength of this novel is definitely in the setting. I enjoyed envisioning the cave, its formations, the waterfalls, and the strange flora. I just recently finished Journey to the Center of the Earth again, and so this was a nice follow-up. And a couple of critiques. Spoilers ahead! The cult aspect is underutilized. The members seem more a bunch of misfits rather than a group grounded and ruled by a set of strange, fringe beliefs. Some members claim to be Christian, others not. Fertility rites and gods are hinted at but disappointingly never explored or exploited. The story sort of lost my interest because I was really expecting some "diabolical cult" members, as promised in the blurb. They are cranky and demanding--like squatters sharing a derelict building--but not diabolical. Even the leader, who has somehow mutated to become something subterranean, lacks the charisma, slyness, and fervor I expected. On top of that, from the very beginning I found both Jeremy and Karen to be unsympathetic. Jeremy is manipulative and downright mean to Karen. I had to question why she was with him in the first place. Because she was weak and gave in to him, I disliked Karen. I wanted her to stand up for herself more than she does. The ending was unexpected. Granted, at least Karen did not stay with Jeremy, but her change of heart did not seem supported by her point of view leading up to the final decision. I wish there had been more foreshadowing as to Karen's transformation. Karen and Jeremy are exploring a cave in West Virginia when they stumble into Rahm, the leader of an underground cult. This group of people decided to go underground many years earlier and now they are starting to have problems. Mutations are happening to those that have come down and left many of them infertile. It’s just bad luck that Karen and Jeremy are discovered since Rahm has decided that their child can fix what has happened to the people. Of course Karen and Jeremy want nothing more tha Karen and Jeremy are exploring a cave in West Virginia when they stumble into Rahm, the leader of an underground cult. This group of people decided to go underground many years earlier and now they are starting to have problems. Mutations are happening to those that have come down and left many of them infertile. It’s just bad luck that Karen and Jeremy are discovered since Rahm has decided that their child can fix what has happened to the people. Of course Karen and Jeremy want nothing more than to escape, but this is just the beginning of the trouble they are about to face. What starts as a harmless journey quickly becomes hell for Karen and Jeremy. Although newlyweds neither really knew as much about the other as they thought. The truth is going to come out and it is going to be brutal. Both are going to be change from this experience in more than one way. Watching Karen and Jeremy’s true selves come out was brutal but very realistic. And the caves, OMG! What kind of third ring of hell did these two fall into? This is a wonderful horror story with one heck of an ending. I couldn’t put the book down and had the creeps that night. Ugh!! !This is a great story for those that love horror stories. I received Something Down There from Book Unleashed for free. This has in no way influenced my opinion of this book. This book just didn’t do it for me. The images were incredibly difficult to visualize. Third person narrative is a difficult one to nail, and this one didn’t hit the mark for my standards. I never felt fully invested in the book or the characters, which is truly a shame. Everything just felt very surface level, which is hilariously disappointing given the nature of this book. What the fudge Nancy? WHY!? I hope you’re writing a second part or some sort of Epilogue or something because I just want to smash my brains in after finishing it. Thanks for the anxiety! I have read many novels but none with this unique story line. I was entranced from the beginning. One of those hard to put down books. Can't wait to see what Nancy writes next. If this is her first novel then this is the author to watch out for.